Sekishu 24" x 39" is 35 gsm and white/cream. Sekishu is one of the oldest hand made papers in the world. It is made from Kozo, fibers and has a cream based white color. This paper has a feathered edge when water torn which allows it to blend with the paper which it is being mended. It is used for hinging, mending and backing. Sekishu is unsized and a great choice for printing. You can also use this paper for book production, repair and restoration. Sekishu can be used for collage work, intaglio printmaking and painting. 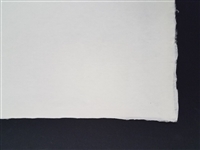 Kozo 25" x 38" is 46 gsm and has a natural color. This paper is exceptionally strong for its weight and has long fiber deckled edges. 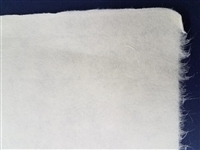 This paper can be used for a variety of different art projects: intaglio, mixed media works, bookbinding, restoration, drawing, painting and printmaking.